For the fifth consecutive year, Nelson Mandela Metropolitan University (NMMU) has produced the national winner in the Society for Dyers and Colourists (SDC) International Design Competition. 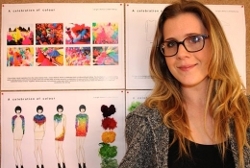 BTech Fashion Design student Leigh-Anne Liebenberg is following in the wake of Xhosa-knitwear champion Laduma Ngxokolo and three others, in representing South Africa in the international leg in Mumbai, India, in November this year. Three of the previous NMMU winners went on to win the international competition. A delighted Leigh-Ann, who works part-time at Silver Spoon Clothing, was overwhelmed when she received news of her victory against top fashion students from throughout South Africa. “I didn’t know whether to laugh or cry because you never expect it to be you,” said Leigh-Ann whose interpretation of “fashion for the future” was inspired by the Holi-Colour Festival from India. While working at the Port Elizabeth-based clothing store, Leigh-Ann saw an opportunity for recycling discarded fabrics in marketable garments. She experimented with discarded materials and old craft techniques to create unexpected, original combinations, finally settling for “a celebration of colour” garment consisting of a natural cream mohair base, with a colourful detachable neckpiece dyed by hand, using food colouring. The competition’s brief was to demonstrate the creative, imaginative and original use of colour. Leigh-Ann explained that during the Holi-Colour Festival, participants wear white clothing and multi-coloured powder paint is thrown around in a celebration of colour – as was also the case the city’s Color Run hosted at NMMU. The same impression of paint thrown at random has been captured in her design. Leigh-Ann will complete against students from eleven countries including Australia, New Zealand, Hong Kong, Bangladesh, India, Ireland, Pakistan, Singapore, Thailand and the United Kingdom. In-between writing tests and assignments, and working, Liebenberg doubted she would even finish her design in time to enter the competition. But she did, and will shortly wing her way to India to compete for £1000 compete and the Veronica Bell Trophy.